A natural curiousity, the amethyst stalactite slice hand knotted silk necklace. 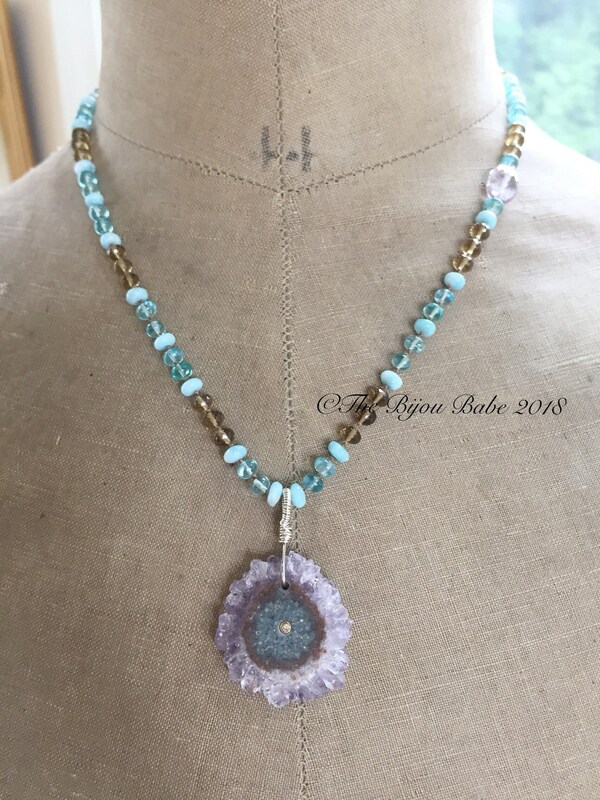 A completely natural amethyst stalactite slice with an agate center is the focal point for this necklace. Stalactite slices of this caliber are rare to find, and do not confuse it with the electroplated stalactite slices that are saturated on the market currently. This is a natural and high quality specimen, which I have had set with an 18kt gold white topaz bezel. 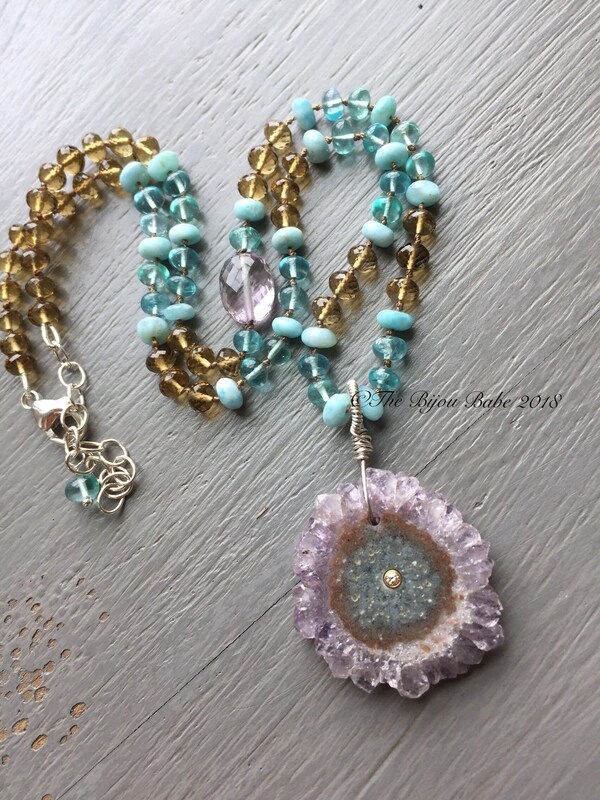 The stalactitess has a lovely light purple amethyst shade on the outer formation, and the agate center has a couple of layers of colors, including light brown and teal. To accent the colors in the stalactite, poolwater blue smooth polished apatite and Caribbean blue larimar rondelles, faceted beer quartz rondelles have been hand knotted on silk cord. Hand knotted silk necklaces provide the most lovely drape on one's neck, and feel lovely when worn. A single AAA faceted oval of pink amethyst accents the side of the necklace to highlight the outer rim of the stalactite slice. A one of a kind piece! Amethyst stalactites are rare specimens found inside amethyst geodes. They are formed millions of years ago in hot lava as gas pockets. From there, fluid silica then penetrates inside, and together with a combination of iron particles, it creates the purple tone. When all the compositions cool off, it produces the quartz crystal inside. The geodes are then sliced and polished on both sides, which makes them perfect for creating into amazing and unique jewelry! Can't you imagine a bewitching Sea Nymph wearing this necklace to lure unsuspecting mariners toward her? The colors are magical and the pendant is so mesmerizing! All metal used for pendant bale, clasp and extension chain is 14kt gold filled. Your 'Siren Song' will ship USPS first class mail with tracking and insurance in the US, and will be packaged in a lovely gift box tied with ribbon. Please note that this is a delicate and rare piece of jewelry, and should be treated with care. As with all jewelry, it should not be worn while swimming or bathing (or sleeping!). Please apply perfumes, lotions and hair products first, jewelry second. When not wearing the necklace, please store it by itself in the gift box provided, since both the slice and the apatite are fragile. Taking care of your artisan jewelry will allow you to enjoy it for years to come!